2Lt George K. Richter (P) - Mission 284 flow as CoPilot with a combat orientation Pilot Other missions flown as 1st Pilot. Combat tour completed on 21 March 1945. 2Lt Robert A. McMullen (CP) - Twenty-Seven missions with 2Lt Richter (286 thru 323 & 328). One mission as CoPilot with another Pilot (285). Four missions as a Lead Crew Tail Gunner/Observer with other Pilots (321, 322, 329, 330). Combat tour completed on 8 March 1945. 2Lt John M. Thompson (N) - Sixteen missions with 2Lt Richter (284 thru 290, 314 thru 321). Eight missions with other Pilots (317, 319, 320, 321, 329, 330, 344, 359). Last mission on 14 April 1945. 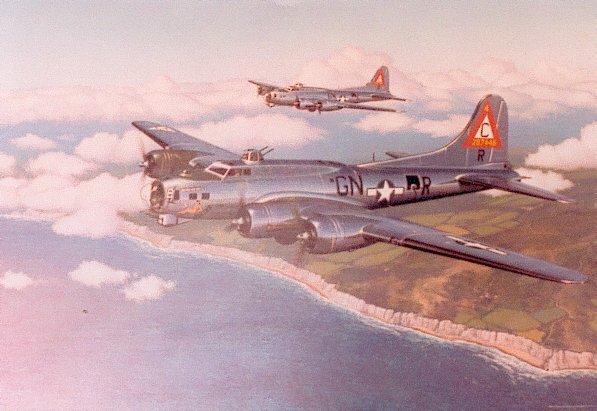 2Lt Walton M. Stephens (B/N) - Eleven missions with 2Lt Richter: As Bombardier (284, 285, 286, 290, 296, 297, 298A & 301); As Navigator (304, 306 & 307). Nine missions with other Pilots (302, 303, 310, 311, 314, 317, 322, 329 & 341). Last mission on 20 March 1945. T/Sgt Grover P. Bates (E) - Twenty-four missions with 2Lt Richter (284 thru 310). Five missions with other Pilots (338, 341, 343, 357, 358). Last mission on 11 April 1945. S/Sgt Alfred G. Kemmerer (R) - Thirty-three missions with 2Lt Richter (284 thru 339). One mission with another Pilot (320). Combat tour completed on 18 March 1945. S/Sgt Donald S. Smith (BTG) - Thirty-four missions with 2Lt Richter (284 thru 342) Completed combat tour on 21 March 1945. Sgt James D. Vernon (WG/E) - Thirty-one missions with 2Lt Richter: As Waist Gunner (284 thru 316); As Engineer/Top Turret Gunner (323, 324 & 328). Three missions with other Pilots (318, 319 & 320). Completed combat tour on 22 February 1945. 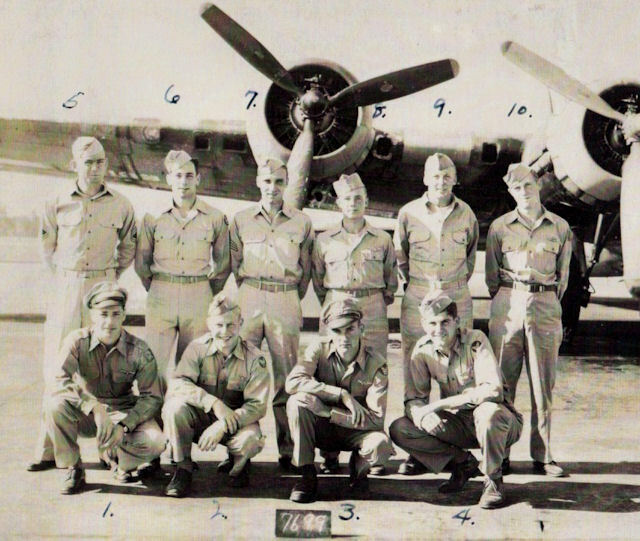 Crew flew without a Waist Gunner following mission 316. S/Sgt Robert E. Chisholm (TG/WG) - Thirty-four missions with 2Lt Richter: As Tail Gunner (284 thru 328 & 342); As Waist Gunner (331 & 339). Combat tour completed on 21 March 1945. Mission 299, 8 January 1945 to Schweiuch/Koblenz, Germany in B-17G 42-102569 Miss Lace (427BS) GN-X. The B-17 was badly damaged following the landing at Molesworth by 2Lt George K. Richter. The hydraulic system was drained by T/Sgt Grover P. Bates when he discovered that the Pilot's hydrauilic switch had no "off" position. Before landing the hydraulic system was recharged and the PSI reading was normal. The B-17 was landed long on a short runway with no haudaulic pressure or brakes. CoPilot 2Lt Robert A, McCullen was unable to build up hydrailic pressuire by vigorous hand-pump action. The Fortress ran out of runway, crossed a road and bounced, smashed into a field and bounced again, and stopped against a wet, soggy and unrelenting haystack about 150 or so yards beyond the road. The sudden stoppage of the Nos. 3 and 4 engines caused the right wing to rupture and buckle at its fuselage junction. The crew all got out uninjuired and ran like scalded rabbits through what seemed like two feet of mud. The bent up Miss Lace was sent to the 303rd BG(H) boneyard and salvaged after 87 missions.